Perennials; long-lived; sexual; caudex woody. Stems usually 2-5 per caudex branch, arising laterally proximal to sterile shoots or rosette, often elevated above ground surface on woody base, (1.5-)2-7 dm, densely pubescent proximally, trichomes short-stalked, Y-shaped, 0.2-0.4 mm, often mixed with 3-5-rayed or (rarely) simple ones, usually glabrous distally. Basal leaves: blade oblanceolate to obovate, 3-15(-20) mm wide, margins dentate, ciliate proximally, trichomes to 1.2 mm, surfaces moderately to densely pubescent, trichomes short-stalked, 3-6-rayed, 0.2-0.4 mm. Cauline leaves: 4-12(-17), not concealing stem; blade auricles 0.5-3.5 mm, surfaces of distalmost leaves glabrous. Racemes 16-35-flowered, usually unbranched. Fruiting pedicels usually horizontal, straight or slightly recurved, (6-) 10-25 mm, usually glabrous. Flowers ascending at anthesis; sepals pubescent; petals white to purplish, 5-9 × 1-1.5 mm, glabrous or sparsely pubescent (occasionally some trichomes abaxially); pollen ellipsoid. Fruits widely pendent, not appressed to rachis, not secund, usually curved, edges parallel, (3-)4-7 cm × 1.7-2.1 mm; valves glabrous; ovules 60-96 per ovary; style 0.05-0.4 mm. Seeds uniseriate, 1.1-1.5 × 0.9-1.2 mm; wing continuous, 0.1-0.2 mm wide. 2n = 14. Flowering Feb-May. Rocky slopes and gravelly soil in warm desert, chaparral, low montane habitats; 200-1700 m; Ariz., Calif., Nev., N.Mex., Tex., Utah; Mexico (Baja California, Chihuahua, Sonora). The circumscription of Boechera perennans followed here is much narrower than that adopted by R. C. Rollins (1993). 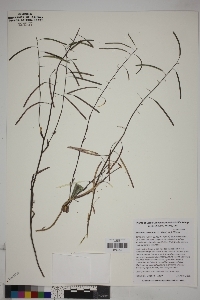 The most significant difference is the removal of Arabis gracilenta. Recent studies (M. D. Windham and Allphin, in prep.) indicate that the latter represents an older name for the species usually called A. 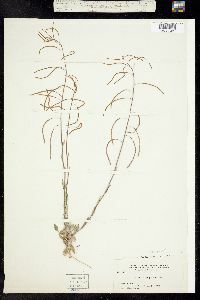 (Boechera) selbyi. Although superficially similar, B. perennans is distinguished from B. gracilenta by having stems arising from above ground surface on woody bases, proximal stems with mostly Y-shaped trichomes, strongly dentate margins on basal leaves, and uniseriate seeds. Typically, B. perennans is a sexual diploid largely restricted to the warm deserts of Arizona, California, Nevada, and southern New Mexico. Plants of B. gracilenta are scattered across the Colorado Plateau (northeast of the range of B. perennans) and are apomictic triploids, apparently produced by hybridization between B. fendleri and B. pallidifolia.